Richard Wainwright – Temporary CEO of a Biological Development Company. Dr. Dwight Butler – Scientist studying Viruses. Deep in the secret recesses of a Cold War lab, the Russians created tons of deadly bio-weapons. Now, decades later, a protege of that Russian research is about to release weaponized Ebola into the heart of the South’s most iconic city: Atlanta, where the symbols of American “decadence” range from a happily diverse population to the Coca-Cola museum and CNN headquarters. A preliminary test of the horrifying virus demonstrates the unspeakable suffering of its victims–and alerts the Centers for Disease Control that a terrible pandemic is in the making. CDC Virologist Dr. Dwight Butler begins a frantic effort to track down the source of the virus before it’s too late. For new BioDawn CEO Richard Wainwright, it quickly becomes clear that the “accidental” plane crash that killed the pharmaceutical company’s entire executive hierarchy may have some connection to the evolving threat. Suddenly, Richard is being stalked by a hit woman. He and Butler join forces to find the lone terrorist at the center of a plan that could unleash the Black Plague of the 21st century. When this book was offered to me, it immediately caught my attention. I’d always liked books like The Andromeda Strain and Next by Michael Crichton. This was in a similar vein. A terrorist threatens to unleash a biological weapon on a city. The reader almost never knew where the bad guy was going to strike, or what was going to happen. You are able to really get into the mind of Richard and see his fears. You also get to see things somewhat from the terrorists point of view. The reader really does get the sense that this terrorist draws no lines in what he’s willing to do. People die, some due to their own involvement, some merely got in the way. 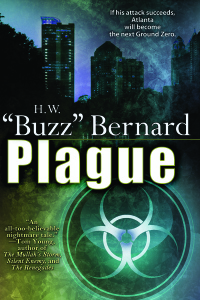 If you like bio terror type books, then grab a copy of Plague. I think you’ll really enjoy it. If I were to give it a rating, I’d say older teens and adults due to the content and subject matter. The author seemed to leave things open for a follow up novel, so I hope he does do a followup, as I’d be eager to read it. 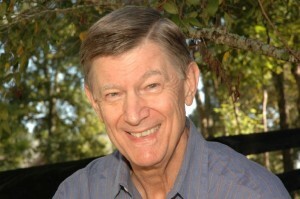 H. W. “Buzz” Bernard is the author of EYEWALL and PLAGUE. EYEWALL, his debut novel, became a number-one Kindle best seller. PLAGUE was released in September 2012. Buzz is a veteran meteorologist having spent 13 years as a senior meteorologist with The Weather Channel, and 33 years as a weather officer in the U. S. Air Force. His background as a meteorologist informs EYEWALL. He’s had first-hand experience with hurricanes, having penetrated the eyewall of Hurricane Felix in 1995 with the Air Force Reserve Hurricane Hunters. The mission he went on wasn’t nearly as exciting–or as terrifying–as the one described in EYEWALL, but he did get an up-close and personal look at how the job is done. At The Weather Channel, he worked closely with some of the most highly regarded hurricane forecasters in the business. Besides his trip with the Hurricane Hunters, he’s flown air drops over the Arctic Ocean and Turkey, and was a weather officer aboard a Tactical Air Command airborne command post (C-135). Additionally, he’s provided field support to forest fire fighting operations in the Pacific Northwest, spent a summer working on Alaska’s arctic slope and served two tours in Vietnam. Various other jobs, both civilian and military, took him to Germany, Saudi Arabia and Panama. He stepped away from a weather-themed book to write PLAGUE, mainly, he says, because the subject terrified him. Buzz is a native Oregonian and attended the University of Washington in Seattle where he earned a degree in atmospheric science and studied creative writing. He’s currently vice president of the Southeastern Writers Association. After leaving active duty with the Air Force, he spent twenty years in New England, but now lives in Roswell, Georgia, near Atlanta, with his wife, Christina, and overly active Shih Tzu, Stormy. Buzz is at work on his third novel now, another weather-related drama, SUPERCELL. His Website can be found at www.buzzbernard.com. *Disclaimer* A special thanks goes out to Dorothy Thompson at Pump Up Your Book Promotions for a review copy of this book. It in no way influenced my review. You can discuss it here or join my facebook page and discuss it there. This entry was posted on Thursday, February 21st, 2013 at 11:55 am	and is filed under Blog Tour, Books, Fiction, Politics, Thriller. You can follow any responses to this entry through the RSS 2.0 feed. You can leave a response, or trackback from your own site.